How to spend a day in Berlin? 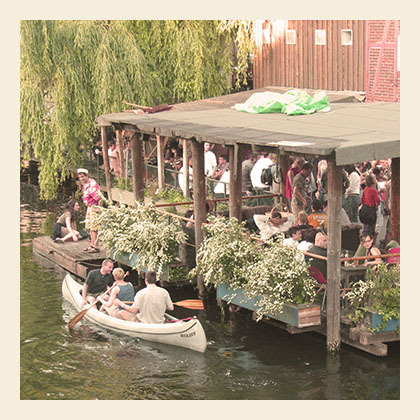 EastSeven Berlin Hostel made a top 20 of popular sights. Down below you find an overview of some of the most beautiful and amazing sights in Berlin. If you´re not sure jet how to spend your day in Berlin, just check out the top 20, with our recommendations on some of the coolest buildings, museums and parks Berlin has to offer! Some of the attractions are even for FREE!!! For an in-depth look at all of these sights, and many more besides, join the Brewers Best of Berlin Day Tour. Brewers Berlin also offers a free sight seeing tour, which covers most of these sights. Tours also begin at our wonderful hostel. TV Tower – Built in 1969 as a symbol of East German socialism, this 368m tower, the largest structure in Germany, even has its own revolving café/restaurant. A trip to the top also offered a rare chance for East Germans to see what life on the other side of The Wall was really like. Reichstag – The German parliament building, re-opened in 1999 after the government and most of the ministries moved from Bonn to Berlin. British architect Lord Norman Foster redesigned this place, complete with a huge glass dome with public access, so you can watch the politicians at work. Brandenburg Gate – Every 10, 20 and 50 cent German Euro coin is minted with a picture of this big city gate on its reverse side. Stranded in a lonely no-mans land between 1961 and 89 thanks to the East German government, no other structure in Berlin better symbolises the temporary division of the city. Berliner Dom – Perhaps the most over-decorated protestant church in the world and once home to the Nazi partys Reich church. Bombed out during WW II, the Berlin Cathedral was restored to its current glory in 1993 – complete with a whopping great 7,200-pipe pipe organ. Jewish museum – German-Jewish relations have had their bad times, and surprisingly, although the exhibition names wouldnt give it away, their good times. Daniel Libeskind, the architect behind New Yorks Ground Zero memorial, designed this Museum. Museum Island – Surrounded on all sides by the River Spree, Museum Island is literally an island with museums on it, isnt that clever? It is not only home to some of the citys top class museums such as the Altes Museum and the Pergamon Museum, but also the Berliner Dom and the tranquil Lustgarten. Lustgarten – Dont be confused by the name, Berlins naked people are running around the citys 500acre Tiergarten just down the road. The Lustgarten started its life as a cabbage patch for the nearby city palace, later used as a military parade ground, now a grass garden. Holocaust Memorial – Berlins ultra-controversial memorial for the murdered Jews of Europe, 2,711 concrete blocks jutting off at offensive and suffocating angles. Co-incidentally only a stones throw away from the site of Adolf Hitlers former underground lair, the Führerbunker. Potsdamer Platz – This was the glitzy centre of Germanys debauched 1920s metropolis, and the site Europes first traffic light system. Smashed into rubble during WW II, its now home to Europes fastest elevator and a mass of steel and glass buildings said to represent the future of Berlin. Topography of Terror – Back in 1987 a group of students excavated, with little more than their bare hands, the cellars of Berlins former Gestapo and SS headquarters. The Topography of Terror is the fruit of their labour, an open-air exhibition documenting what happens when a totalitarian regime tortures its people to death for fun. Checkpoint Charlie – Berlins most famous crossing point between East and West and a lasting symbol of the citys fragile Cold War relations. Commemorated today by an ersatz replica of the original American checkpoint and two historically inaccurate pictures of Soviet and American soldiers. Gendarmenmarkt – Touted by many guidebooks as the prettiest square in Berlin, Gendarmenmarkt is famous for its two churches – one Protestant, one Catholic – each built opposite each other by the opposing religion. Not often that happens. DDR Museum – Using the paraphernalia of shopping, fashion and family life Berlins DDR museum attempts to introduce visitors to what for millions of East Germans was once everyday life. Play Hausfrau in an authentic DDR kitchen and living room, or experience first-hand what it was like to be spied on. Tacheles – One-time department store then SS headquarters in the heart of Berlins former Jewish quarter, the Tacheles was taken over by squatters in 91. Behind the buildings bombed out façade is a wealth of art studios, two cinemas, 3 bars, a beach bar, a café and a newly opened bourgeois restaurant. Hackescher Markt – Hackescher Markt was once home to booming businesses during the Industrial Revolution. Its now famous not only for its attractive station, but as a jumping off point to the nearby Hackescher Höfe complex. Karl Marx Allee – Rent a bike at the reception and explore this sweeping communist boulevard where the GDR Government used to proudly present their weapons of mass destruction at their May Day parades. Raw Temple – An alternative entertainment hub including an indoor skate hall, a former Nazi hide-out used now for freestyle rock climbing, an open air cinema and regular live music. Volkspark Friedrichshain – A beautiful park, excellent for jogging or having a picnic. In the middle youll find Friedrichshains highest hill, which provides a 78-metre high view over Berlins flat terrain. The hill was actually man-made to cover up a destroyed anti-aircraft bunker from World War II, as well as several tonnes of bombed out rubble. Stasi Headquarters – Take the U5 subway at Alexanderplatz to Magdalenenstrasse and visit the former headquarters of the Stasi – East Germanys cruel and meticulous secret police – in Normannenstr. The building has been transformed into a museum and you can walk through the preserved offices of some of the GDRs most powerful men. A disturbing look at Berlins very recent past. Schloss Charlottenburg – If you are interested in Prussian architecture and history but dont have time to travel to Potsdam, then Schloss Charlottenburg is the perfect inner-city alternative. This outstanding palace and its surrounding gardens are not only visually stunning, but will also give you a detailed insight into the lifestyle of the Prussian emperors.